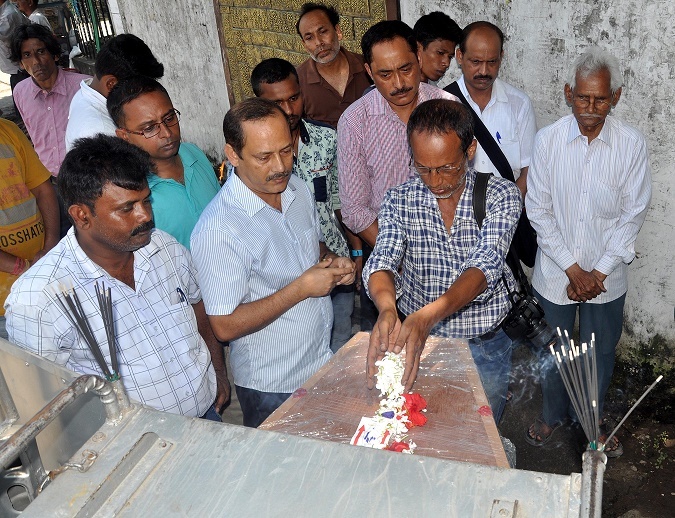 Guwahati, 10 June: Journalist Nand Kishor Gupta, who died yesterday in Mumbai, was flown to the city today and paid last respect by the members of Guwahati Press Club before his creation. Gupta, 46, breathed his last at Mumbai airport around 3.10 pm on Thursday on his return journey to Guwahati. He went to Mumbai on 3 June to get admitted at Tata Memorial Hospital for his treatment on gallbladder cancer. On his arrival today morning from Mumbai, mortal remains of Gupta were brought to press club where the media fraternity paid tributes to him on his way to his residence in the city. His cremation was done in the evening after family rituals. Gupta left behind his mother, wife, daughter & son besides a host of relatives and well wishers. Gupta was associated with Purvanchal Prahari as a senior sub editor till his demise. He also worked for Hindi dailies namely Hindi Sentinel and Pratah Khabar. It may be mentioned that the press club had earlier appealed for financial aids to Gupta’s treatment, which was promptly responded by various individuals. Now the press club urges the State chief minister Sarbananda Sonowal to sanction an ex-gratia amount for the bereaved family.